Part of the fun of creating Phungo Cards is finding interesting subjects. I typically try to put together a checklist that has a touch of Allen & Ginter. This means throwing in some non-baseball cards. Last year I accompanied Fiancee Phungo to a reading and book signing by Sookie Stackhouse/True Blood Author Charlaine Harris. I have never read any of the books but I have enjoyed the season or so of the HBO True Blood Series that I have been able to watch. It's not baseball but it is still fun Television. To my surprise Harris filled the sizable Philadelphia Free Library auditorium to overflow(The Sookie Book "Dead in the Family" had just been released that week) - We got there 15 minutes early and sat in the last few rows of the theater. You could tell Harris was a veteran of the signing circuit and was comfortable in the environment. As I recall she spent about 15-20 minutes giving background on herself, her career, and her books including the discussing "True Blood". I am not sure if she did a reading but she did have a substantial and entertaining Q&A session - Half perhaps more of the Questions were regarding the TV series, but this did not bother the author. Harris had many a funny and interesting anecdote about herself as well as her books, characters, and family. She kept the evening moving and drew many laughs from her young and enthusiastic audience. I took the photo for the above card during the book signing. The line for the signing wrapped through and perhaps halfway around the Philadelphia Free Library - That is a good size line - This is not a small buidling. But the weather was pleasant and the line moved quickly. It was worth it, briefly meeting Ms Harris was a noteworthy and fun experience. The newest Charlaine Harris/Sookie Stackhouse book "Dead Reckoning" came out last week ready for the Summer reading season - I know this because Fiancee Phungo has ger head buried in the new book while I, Mr Phungo, Check out card blogs, write postings, and follow the Phils. The next installment of True Blood will be season 4 and will air later this summer. This link will direct you to a Podcast of the Charlaine Harris event at PFL. 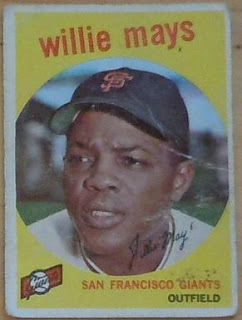 In Celebration of Willie Mays 80th Birthday today we present the 1959 Topps Willie Mays FourSome. We lead off with a card that Connects a Phillies Legend with Mr Mays. Mays was also featured in the Hi Numbered All-Star Subset. We finish One of my all-time favorite cards is this one which honors a catch you will see repeatedly this weekend if your a baseball junkie. How can you not love this card. I have been seeing the grainy footage of this catch since I was a kid and here it is on a 50 year old baseball card. 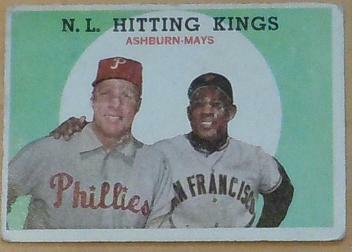 One of the oddities about the 1959 Topps set is the All-Star set. Despite being part of the High Number Series the All-Star cards of stars are typically much cheaper then the more common base cards. The Hi Number May All-Star has sold recently on eBay for $9.33 (rough) to $13.01 (more passable). Low Recent auction for the other special cards was $7.00 for Ashburn/Mays and $7.03 for the Mays Catch. The lowest price I found for the #50 Base card in reasonable condition was $31 for a Graded (VG) card, Although the card is available via BIN for $28. All prices listed include S&H, The Cards that I actually picked up were likely part of a larger lot and there may be a slight volume discount reflected in the purchase price. As usual, I am a little behind - everybody is checking out Gypsy Queen and I am busting Topps Heritage, but at least I am busting a box from the current year. I was initially on the fence about building 2011 Topps Heritage - A recent Posting by A Cardboard Problem speculated on the rumour that the Hot Boxes (containing green tint chrome cards) were packaged differently. At the CSA show in Oaks PA a few weeks back I found one of these Potential Hot Boxes. In the name of Trading Card Research I was compelled to break the box. Unfortunately, The Box was not a Hot Box but remained a fun box to open and I am happy to be building 2011 Topps Heritage. It is the first Topps Baseball Set I have elected to build since 2008 Heritage. I am pretty sure that at some point I will look into 2009 Goodwin Champions, but right now that project is still in the thinking about stage. The Box had two toppers - A 50th anniversary of Don Clendennon and a David Price Baseball Fiver. Not sure how I feel about Topps QC on this one, The Clendennon card is in reasonable shape if I was picking it up at a show as a 50 cent common, but this card is in fair shape and horribly cut. 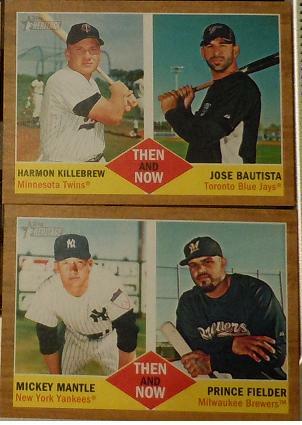 Don't get me wrong the Anniversary cards are my favorite box topper, I just think that at 1 in every other box Topps could do a little better on the buyback end. I was also hoping for a baseball buck and Price is a nice one to get. I don't get including the leaders cards in Chrome. It is only a 100/200 card set why bother with duping a couple of floating heads on a single card. BF-4 Robin Roberts - would of liked him more in a Phils Uni for this one. I love Thome, but I don't think of him as a New Age Performer at this point in his career. Votto might be my favorite non-Phil young player of the moment. every year this is my least favorite insert in heritage - although they are the easiest to make fun of. for example I refer to the Mantle/Fielder card as a celebration of Drunk Vegetarians - which reminds me of every "art student" I knew in college. Yes I was disappointed this was not a Hot Box, but I am happy with my decision to build 2011 Heritage. 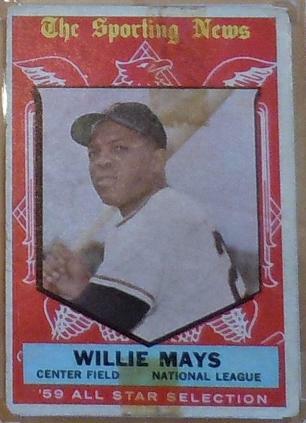 I remain a fan of heritage, and have always enjoyed the 1962 Topps set. For the most part the inserts are interesting and the 50 or so Heritage cards I already picked up had enough unique cards to get me over the half way point in the set.